Perhaps not the most exciting publication of the year to date but nevertheless some interesting information in the new Higher Education Statistics Agency report on Income and Expenditure of HE institutions. 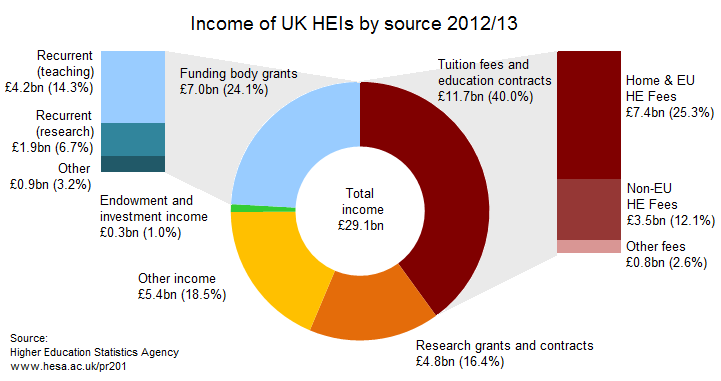 HE Finance Plus 2012/13 shows that the total income of higher education institutions (HEIs) in 2012/13 was £29.1 billion. Funding bodies provided £7.0 billion of this income, while tuition fees and education contracts contributed £11.7 billion. The total increase in income over 2011/12 was 4.5%. And then there is also this helpful summary of total expenditure. Unsurprisingly, the bulk of spend (just over 55%) is on staff. 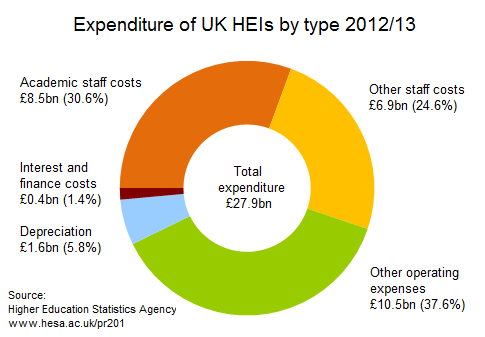 Total spend has increased by 4.7% over 2011/12 and expenditure on staff has risen by 4.1%. It will be interesting to see how this global profile of total spend changes in subsequent years. One thing is absolutely clear from this summary: with growth in spend outstripping income by 4.7% to 4.5% the position is unsustainable. And it’s only going to get worse in terms of teaching funding. So either institutions will have to find new ways to raise more money or reduce expenditure. The future doesn’t look very bright. It’s a rich university’s world.